Q: What are the differences between the German/HongKong Version and the original R-Rated Version? "A Positive recommendation of The Minion"
This post may betray parts of the plot to the reader and also ruin the movie for the reader if they have not already watched it. The first paragraph is solely a recommendation and has no information about the movie or its outcome. So it is safe to read, any paragraph following may or may not contain information about the movie. Read this at your own peril. This is without a doubt one of the best movies I have ever seen, I would highly recommend this movie to anyone. Dolph Lundgren (Lukas) is at his best and Françoise Robertson (Karen Goodleaf) shines in this movie. This story is well written and has a great plot, with some great choreographed fight scenes. The Director (Jean-Marc Piché) did such a great job when he directed this movie that it is obvious that he put in allot of hard work and long hours in putting this great movie together. The actors perform so superbly that I would have to say that they are great actors and actresses. As to the special effects they did such a great job making the actual fighting seem real. It is so obvious that anyone who has seen this movie would see how great it is. I would recommend to anyone that they either purchase, rent, borrow, or watch this movie on TV. Karen Goodleaf shows great courage and heroism throughout the movie, and endures the death of a loved one with dignity. This movie unlike so many others potrays the Native American Community as an honorable and respectable community with a unique culture and value system. Lukas displays honor, dedication, loyalty, adoration for god, and many other attributes that are so often not potrayed in the common American movie. 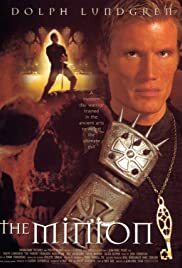 Dolph Lundgren carries out his mission to prevent the Minion from releasing Lucifer from his prison with a missionary zeal. The potrayal of the Catholic Church and the Knights of Templar was without a doubt one of the best.